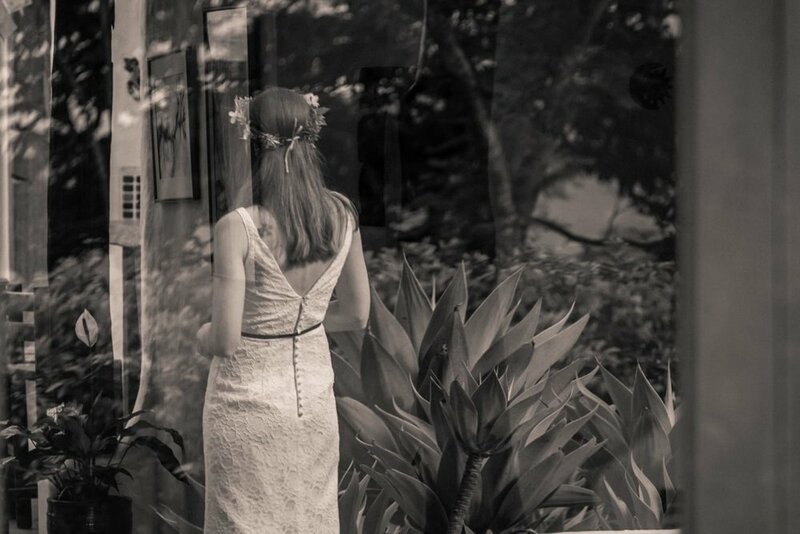 Of the many destination weddings we've photographed in Costa Rica, Kassie and Logan's was one of the most, if not the most, unique. It was just the two of them. This in itself was not unique. There was no officiant, no bridesmaids, groomsmen, best man, ring bearer, flower girl, or family or friends. No one walked Kassie to the altar. There was no reception, first dance, cake cutting ceremony, garter or bouquet toss. It was just Kassie and Logan, two people deeply in love who wanted to give themselves to each other, to express how much they loved each other, to commit themselves to each other as each other as the witness, as the only witness that mattered. It was sincere. It was heartfelt. It was beautiful. 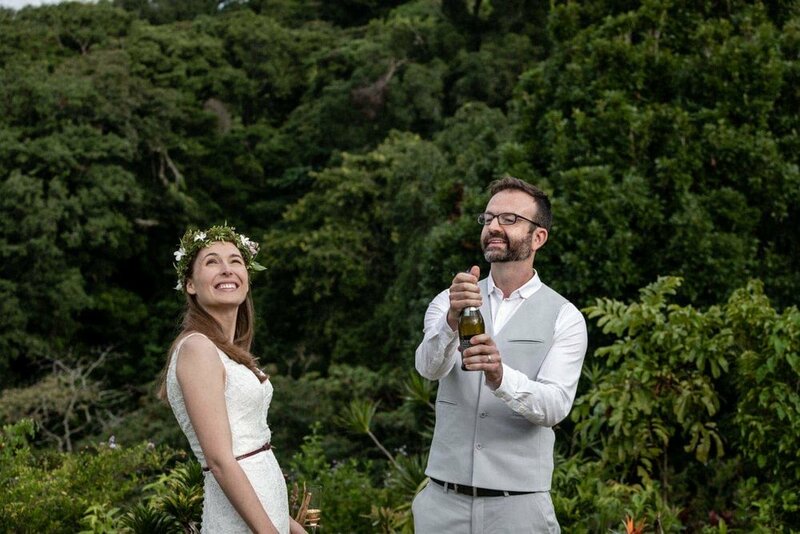 In the manicured garden at the house they rented in a rainforest in Costa Rica, they created their own altar and ceremonial space that was surrounded by rainforest-covered hills and covered by a dramatic overcast sky marked by patches of intense blue. 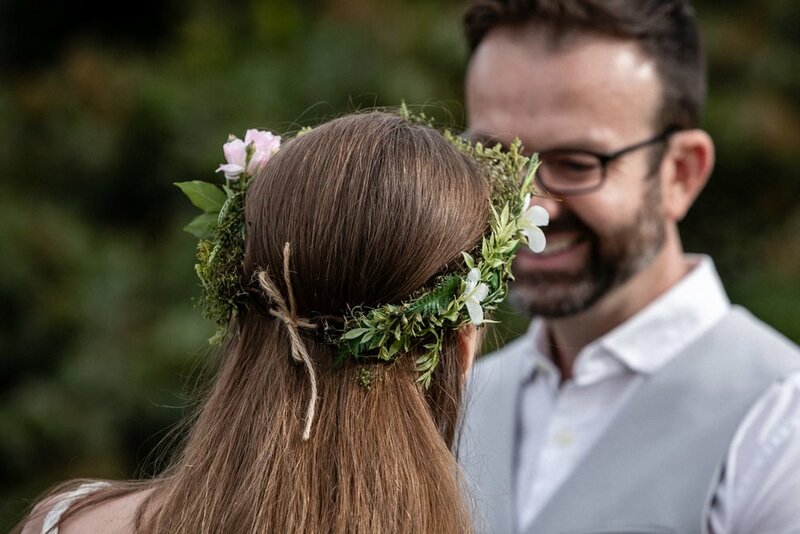 There was a small rustic table made from a tree on which sat the book containing their hand-written wedding vows behind which was a small, dried tree branch serving as the ring bearer that partially hid the bottle of champaign and flutes behind it. Around their altar, they placed pinkish rocks in a circle demarcating the intimate space they would become one. During the ceremony, Kassie and Logan each took their turn reading the their thoughts, their vows, their deepest and most intimate feelings they had for each other and for themselves as a whole that they had written in their leather-bound book. After professing their love for each other, after many smiles, loving looks, and an occasional teary eye, they said "I do" and exchanged wedding rings, then sealed it with passionate kiss, or two or three. After the ceremony, we found a few great locations around the hacienda for bride and groom portraits. The photos of them standing in front of the mirror-like window came out beautifully, as did the pictures of them on the staircase in the tropical garden. There there was the large wood deck in and overlooking the dense rainforest surrounding the hacienda. Perhaps the most amazing site was the waterfall that was about a 20-minute walk from the wedding ceremony location where we took gorgeous photos of Kassie and Logan with the waterfall in the background. On the way back, we stopped at a large and unique tree where Kassie wanted a few more photos. It was a beautiful day. It was a beautiful wedding. Kassie and Logan are a beautiful couple. Thank you Kassie and Logan for the wonderful experience! We hope it was a wonderful for you as it was for us. Check out some of the many great photos we took of Kassie & Logan's wedding.